Scientists now working to determine the source of the enormous accumulation. 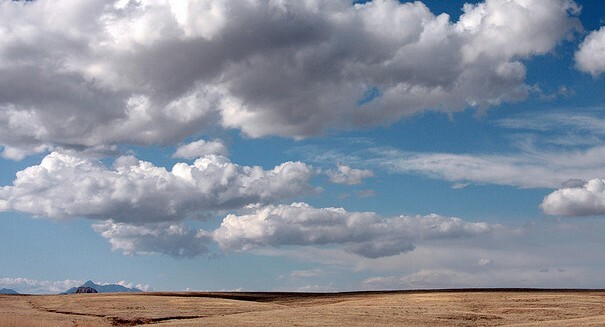 Atmospheric scientists – who continue to be baffled as to its source – are now working to locate the origin of a very large mass of methane hovering over the Four Corners area of the southwestern United States. A report released last year revealed that the bubble is that country’s largest consolidation of greenhouse gases. The study was released in conjunction with a satellite image showing the gas concentration. Four Corners is the only place in the U.S. where four states meet: Arizona, Colorado, Utah and New Mexico. The heart of the methane concentration appears to be east of the actual Four Corners spot, approximately over Durango, Colorado. Determining the source of the so-called methane hotspot could help reduce emissions of the gas, a key contributor to global warming. It is possible, of course, that the contents of the bubble could be sourced from various locations, not just one. Working together on the month-long study are atmospheric scientists from the University of Michigan, the University of Colorado,the National Oceanic and Atmospheric Administration and the National Aeronautics and Space Administration (NASA) . Last year’s study from the University of Michigan and NASA was centered around images taken by a European satellite between 2003 and 2009. They clearly show a hot spot of methane in red – approximately half the size of Connecticut – over the region. The study said the potential impact of the methane concentration holds more heat in the atmosphere than all the carbon dioxide Sweden produces in a year. Although methane does not persist in the atmosphere as long as carbon dioxide, it is nevertheless more efficient at capturing heat. In addition to natural, environmental sources, major emitters of methane include commercial livestock, garbage landfills and the natural gas and oil industries. One possible source of the methane now being examined by scientists are the coal deposits in the region. Such releases can occur naturally, especially when such deposits breach the Earth’s surface. Methane can also be released into the atmosphere when the gas is deliberately extracted from coal beds by energy companies. Methane is the primary constituent in the hydrocarbon gas known as natural gas. In the Four Corners region is the San Juan Basin, North America’s largest area of methane extraction from coal beds. Methane is also released by gas and oil drilling activities, coal mining itself and, hugely, cattle. Conveniently, scientists can determine exactly what type methane they are examining as petroleum sources of the gas have specific hydrocarbons present in the mixture.